We investigate the effects of active galactic nucleus (AGN) feedback on the colour evolution of galaxies found in local (z < 0.2) groups and clusters. Galaxies located within the lobes of powerful Fanaroff–Riley type II (FR II) (edge-brightened) sources show much redder colours than neighbouring galaxies that are not spatially coincident with the radio source. By contrast, no similar effect is seen near FR I (core-dominated) radio sources.We show that these colours are consistent with FR II sources truncating star formation as the expanding bowshock overruns a galaxy. We examine a sample of clusters with no detectable radio emission and show that galaxy colours in these clusters carry an imprint of past AGN feedback. The AGN activity in the low-redshift Universe is predominantly driven by low-luminosity radio sources with short duty cycles. 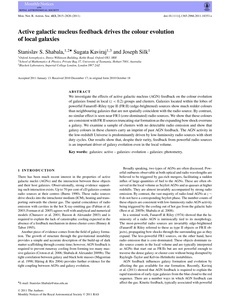 Our results show that, despite their rarity, feedback from powerful radio sources is an important driver of galaxy evolution even in the local volume.